Unfortunately, we at Jarvis Restoration know just what sort of devastation a fire can cause for homes, families, and their possessions. We know that fire damage does not simply stop once the flames are out and, but even more than that, we know how to help. Damages caused by fires often last much longer than the fires themselves, just like water damage lingers after a flood and wind damage can last long after the storm. Oftentimes, flames don’t only harm the structure of your home and its contents. In fact, with their highly acidic smoke, the accumulation of soot, some common chemical reactions, and the water used to extinguish the fire, there are factors that can continue to hurt your home long after it’s out, and even render it completely uninhabitable. 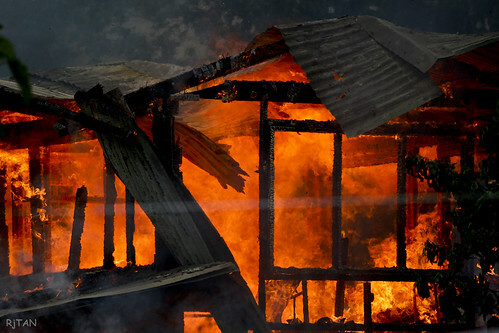 By understanding the significance of a home, by knowing the ways of fire damage, and by caring enough to help, we at Jarvis Restoration have learned to fight fires in a whole new way. Knowing the effects of heat, smoke, and chemicals on your belongings, we also know what it takes to restore them. Our technicians work quickly and diligently to salvage even the most unsalvageable piece of property with everything from flooring to furniture. Using techniques learned to save synthetics, many of your possessions can be restored, thus saving you the extra expense! Furthermore, we want to continue to protect your home during this process. During the restoration we will board up the damaged areas in order to prevent intrusions while we assess the condition of your home’s structure, dry and clean up any wet or sooty areas, and quickly get to work repairing and returning both the interior and exterior of your home as close to its original state as is achievable. Knowing all of this, we work to act as fast as possible on fire damaged homes. We are aware that time is more than money when it comes to people’s houses and their treasures and, as a result, we can be anywhere in Orange County in roughly an hour. Ultimately, by responding rapidly, assessing the loss, and efficiently partnering with your insurance provider, Jarvis Restoration works to return your home to normal as quick as we can. In the end, repairing fire damage is perhaps one of the most difficult restorations to render. When dealing with something so sentimental as a home, there is not much that can hurt more than the bite of a flame. That being said, Jarvis Restoration has worked for years to return each and every one of their effected properties back into the house it was before any fire or flood or storm. Of course, nothing will be exactly the same, but we won’t stop until we get as close to normal as possible. Ultimately, in the same way that we know that the damage of a fire can last long after the flames go out. We understand that emotional damage exists in the process as well. At Jarvis Restoration we do our best to be efficient and effective while also being considerate and kind. We want your house to be what it was before any sort of damage occurred – a home. Trust us to be there and trust us to care, 24 hours a day! Give us a call: (949) 326-7926.